Last week we shared what we believe to be the most neglected topic in today’s dry eye conversation: Nighttime Dry Eye. We feel this way especially as we consider the many different causes of nighttime dry eye and the prevalence of those causes. There are millions of people who experience nighttime dry eye. Our goal is to assist in helping your dry eye patients to look and feel better, naturally. Utilizing a questionnaire is a valuable tool eye doctors have to determine the severity of dry eye for a patient. Two popular questionnaires that address dry eye are the SPEED¹ Questionnaire and the OSDI² Questionnaire. Do your eyes feel worse in the morning than they do throughout the day? Do you use a CPAP? The test involves shining a transilluminator against the eyelid of the patient at an angle and looking for light leak. So easy and it only takes a few seconds – and it can tell you so much about the cause of your patient’s dry eye. We hope these tips help you diagnose nighttime dry eye. If your patients experience Nighttime Dry Eye there is an easy fix. Eye Eco offers a range of proven nighttime masks that naturally and comfortably shelter eyes from the environment, or air leaks from a CPAP mask, and hold in moisture to promote better sleep and eye health. Cornea, SPEED Questionnaire, 2013 Sep;32(9):1204-10 © 2011 TearScience, Inc.
At​ ​Eye​ ​Eco​ ​we​ ​are​ ​dedicated​ ​to​ ​finding​ ​solutions​ ​that​ ​provide​ ​relief​ ​from​ ​dry​ ​eyes,​ ​and​ ​we're​ ​not​ ​the​ ​only ones. Dry​ ​eyes​ ​affect​ ​more​ ​than​ ​40​ ​million​ ​Americans,​ ​but​ ​less​ ​than​ ​5%​ ​of​ ​people​ ​have​ ​been​ ​properly diagnosed​ ​with​ ​Dry​ ​Eye​ ​Disease.​ ​Dry​ ​Eye​ ​Disorder​ ​can​ ​cause​ ​many​ ​health​ ​issues​ ​including​ ​obscured vision,​ ​dry​ ​skin,​ ​and​ ​even​ ​blindness.​ ​It​ ​can​ ​be​ ​caused​ ​by​ ​many​ ​things​ ​-​ ​including​ ​time​ ​looking​ ​at screens.​ ​For​ ​most​ ​of​ ​us​ ​that​ ​activity​ ​isn't​ ​going​ ​away​ ​anytime​ ​soon. At​ ​Eye​ ​Eco,​ ​we​ ​believe​ ​the​ ​best​ ​thing​ ​that​ ​can​ ​be​ ​done​ ​to​ ​keep​ ​eyes​ ​healthy​ ​and​ ​comfortable​ ​is​ ​regular visits​ ​to​ ​an​ ​eye​ ​care​ ​professional. Because​ ​dry​ ​eye​ ​can​ ​have​ ​several​ ​causes,​ ​figuring​ ​out​ ​the​ ​cause​ ​is​ ​an​ ​important​ ​step​ ​in​ ​finding​ ​the​ ​best treatment​ ​option.​ ​Optometrists​ ​and​ ​Ophthalmologists​ ​do​ ​incredible​ ​work​ ​to​ ​make​ ​sure​ ​we​ ​can​ ​clearly and​ ​comfortably​ ​see​ ​everything​ ​in​ ​our​ ​lives. We​ ​want​ ​to​ ​highlight​ ​some​ ​of​ ​the​ ​doctors​ ​who​ ​are​ ​as​ ​committed​ ​as​ ​we​ ​are​ ​to​ ​helping​ ​dry​ ​eye​ ​patients find​ ​relief.​ ​That​ ​is​ ​why​ ​we​ ​are​ ​starting​ ​a​ ​new​ ​campaign​ ​to​ ​acknowledge​ ​doctors​ ​by​ ​presenting​ ​them with​ ​Eye​ ​Eco's​ ​Outstanding​ ​Dry​ ​Eye​ ​Practice​ ​Award. 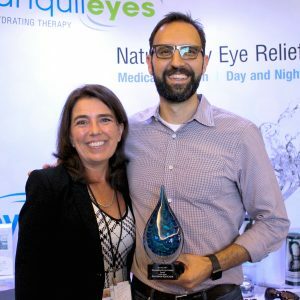 Envision​ ​Eyecare​​ ​in​ ​Asheville,​ ​North​ ​Carolina,​ ​is​ ​one​ ​of​ ​our​ ​first​ ​recipients​ ​of​ ​the​ ​award.​ ​Here's​ ​what​ ​Dr. Larry​ ​Golson​ ​had​ ​to​ ​say​ ​about​ ​receiving​ ​the​ ​award​ ​and​ ​about​ ​treating​ ​patients​ ​with​ ​dry​ ​eye. What​ ​were​ ​your​ ​thoughts​ ​when​ ​Envision​ ​Eyecare​ ​received​ ​the​ ​Eye​ ​Eco​ ​Outstanding​ ​Dry​ ​Eye Practice​ ​Award? We​ ​were​ ​really​ ​excited​ ​to​ ​get​ ​the​ ​award.​ ​We​ ​devote​ ​a​ ​good​ ​deal​ ​of​ ​our​ ​resources​ ​into​ ​treating dry​ ​eye.​ ​The​ ​Envision​ ​Eyecare​ ​team​ ​is​ ​trained​ ​on​ ​the​ ​condition​ ​as​ ​well​ ​as​ ​the​ ​many​ ​different treatments​ ​available.​ ​Then,​ ​after​ ​a​ ​comprehensive​ ​eye​ ​health​ ​evaluation,​ ​we​ ​design​ ​treatment plans​ ​for​ ​our​ ​patients​ ​individual​ ​needs.​ ​Finally,​ ​we​ ​spend​ ​adequate​ ​time​ ​educating​ ​our​ ​patients on​ ​his/her​ ​treatment​ ​plans​ ​and​ ​the​ ​products​ ​we​ ​are​ ​prescribing.​ ​We​ ​find​ ​our​ ​patients​ ​"buy​ ​in" and​ ​are​ ​more​ ​likely​ ​to​ ​be​ ​compliant​ ​when​ ​they​ ​understand​ ​their​ ​condition​ ​and​ ​why​ ​they'd​ ​benefit from​ ​the​ ​treatment.​ ​We​ ​have​ ​dry​ ​eye​ ​products​ ​on​ ​display​ ​in​ ​our​ ​reception​ ​area​ ​so​ ​patients​ ​are aware​ ​of​ ​the​ ​level​ ​of​ ​care​ ​we​ ​provide​ ​in​ ​this​ ​area.​ ​Our​ ​doctors​ ​research​ ​new​ ​technologies​ ​and then​ ​invest​ ​in​ ​the​ ​ones​ ​which​ ​will​ ​have​ ​the​ ​most​ ​benefit​ ​to​ ​our​ ​community​ ​of​ ​patients.​ ​We​ ​were surprised​ ​and​ ​honored​ ​when​ ​we​ ​received​ ​Eye​ ​Eco's​ ​Outstanding​ ​Dry​ ​Eye​ ​Practice​ ​Award,​ ​as​ ​we are​ ​grateful​ ​to​ ​receive​ ​recognition​ ​for​ ​our​ ​care​ ​in​ ​this​ ​area. Envision​ ​Eyecare​ ​opened​ ​in​ ​2008​ ​with​ ​two​ ​employees​ ​in​ ​Asheville,​ ​North​ ​Carolina.​ ​We understand​ ​the​ ​difference​ ​between​ ​eye​ ​care​ ​which​ ​is​ ​executed​ ​as​ ​a​ ​transaction,​ ​versus personalized​ ​eye​ ​care.​ ​​ ​Therefore,​ ​the​ ​focus​ ​is​ ​on​ ​personal​ ​eye​ ​care​ ​because​ ​we​ ​believe​ ​in​ ​living life​ ​to​ ​the​ ​fullest​ ​through​ ​the​ ​best​ ​eyesight​ ​and​ ​health.​ ​We​ ​take​ ​the​ ​time​ ​to​ ​educate​ ​our​ ​patients to​ ​ensure​ ​they​ ​leave​ ​with​ ​an​ ​in​ ​depth​ ​understanding​ ​about​ ​their​ ​eyes​ ​and​ ​the​ ​condition​ ​of​ ​their eyes.​ ​The​ ​Envision​ ​Eyecare​ ​Experience​ ​is​ ​provided​ ​in​ ​a​ ​beautiful​ ​space​ ​with​ ​well​ ​trained​ ​team members​ ​so​ ​our​ ​patients​ ​can​ ​gain​ ​a​ ​sense​ ​of​ ​what​ ​sets​ ​us​ ​apart​ ​from​ ​conventional​ ​eye​ ​care. Do​ ​you​ ​have​ ​a​ ​story​ ​you​ ​can​ ​share​ ​about​ ​how​ ​your​ ​practice​ ​helped​ ​a​ ​patient(s)​ ​find​ ​relief​ ​from dry​ ​eyes?​ ​Please​ ​share. We​ ​had​ ​a​ ​patient​ ​who​ ​had​ ​been​ ​suffering​ ​for​ ​years​ ​from​ ​debilitating​ ​dry​ ​eye.​ ​She​ ​was​ ​a​ ​local acupuncturist​ ​who​ ​had​ ​rheumatoid​ ​arthritis​ ​and​ ​Sjögren's​ ​syndrome,​ ​which​ ​she​ ​was​ ​treating holistically​ ​with​ ​acupuncture.​ ​Since​ ​she​ ​wasn't​ ​getting​ ​her​ ​dry​ ​eye​ ​symptoms​ ​under​ ​control,​ ​she was​ ​willing​ ​to​ ​try​ ​anything​ ​to​ ​get​ ​relief​ ​from​ ​her​ ​dry​ ​eyes. After​ ​trying​ ​several​ ​treatment​ ​modalities,​ ​a​ ​huge​ ​improvement​ ​was​ ​derived​ ​from​ ​the​ ​Lid​ ​Pro​ ​and Meibo​ ​Pro​ ​devices​ ​in​ ​conjunction​ ​with​ ​lid​ ​scrubs,​ ​artificial​ ​tears,​ ​and​ ​warm​ ​compress​ ​goggles. We​ ​were​ ​able​ ​to​ ​get​ ​her​ ​dry​ ​eye​ ​symptoms​ ​under​ ​control​ ​for​ ​the​ ​first​ ​time​ ​in​ ​over​ ​a​ ​decade.​ ​At one​ ​point,​ ​she​ ​actually​ ​texted​ ​me​ ​personally​ ​and​ ​said,​ ​"This​ ​is​ ​the​ ​best​ ​my​ ​eyes​ ​have​ ​felt,​ ​ever!" What​ ​advice​ ​or​ ​tip​ ​do​ ​you​ ​have​ ​about​ ​treating​ ​patients​ ​with​ ​dry​ ​eye? Many​ ​of​ ​our​ ​patients​ ​have​ ​become​ ​accustomed​ ​to​ ​having​ ​dry​ ​eye​ ​and​ ​don't​ ​realize​ ​there's​ ​an issue.​ ​Every​ ​person's​ ​dry​ ​eye​ ​symptoms​ ​are​ ​different​ ​and​ ​there​ ​are​ ​many​ ​causes.​ ​It​ ​could​ ​be environmental,​ ​medication​ ​use,​ ​associated​ ​with​ ​a​ ​systemic​ ​condition​ ​or​ ​due​ ​to​ ​lifestyle​ ​habits. For​ ​instance,​ ​do​ ​they​ ​get​ ​enough​ ​sleep;​ ​do​ ​they​ ​drink​ ​enough​ ​water?​ ​Could​ ​the​ ​problem​ ​stem from​ ​too​ ​much​ ​caffeine​ ​or​ ​alcohol​ ​intake.​ ​Ask​ ​how​ ​often​ ​and​ ​for​ ​how​ ​long​ ​are​ ​they​ ​using devices​ ​on​ ​a​ ​daily​ ​basis.​ ​Look​ ​at​ ​their​ ​medications​ ​and​ ​consider​ ​medical​ ​conditions.​ ​Also​ ​age and​ ​gender​ ​demographics​ ​plays​ ​a​ ​role​ ​in​ ​who's​ ​at​ ​risk​ ​for​ ​dry​ ​eye​ ​syndrome.​ ​​Good​ ​dry​ ​eye​ ​care starts​ ​with​ ​asking​ ​enough​ ​questions​ ​and​ ​asking​ ​the​ ​right​ ​questions​.​ ​Then​ ​really​ ​take​ ​time​ ​to develop​ ​a​ ​customized​ ​plan​ ​for​ ​the​ ​individual.​ ​Some​ ​patients​ ​just​ ​want​ ​to​ ​do​ ​the​ ​minimum​ ​and other​ ​patients​ ​will​ ​want​ ​to​ ​try​ ​everything.​ ​Compliance​ ​is​ ​key​ ​to​ ​success,​ ​so​ ​make​ ​sure​ ​the patient​ ​understands​ ​how​ ​important​ ​it​ ​is​ ​to​ ​follow​ ​the​ ​prescribed​ ​treatment​ ​plan. Lastly,​ ​invest​ ​in​ ​products​ ​to​ ​help​ ​your​ ​patients,​ ​both​ ​retail​ ​and​ ​treatment​ ​devices.​ ​If​ ​you​ ​have​ ​the retail​ ​products​ ​on-hand​ ​(instead​ ​of​ ​sending​ ​them​ ​to​ ​the​ ​pharmacy)​ ​there​ ​is​ ​a​ ​higher​ ​chance​ ​of compliance​ ​using​ ​the​ ​highest​ ​quality​ ​products.​ ​It's​ ​also​ ​convenient​ ​for​ ​the​ ​patient​ ​and​ ​adds​ ​to the​ ​practice's​ ​revenue.​ ​Show​ ​them​ ​how​ ​to​ ​use​ ​the​ ​products​ ​and​ ​make​ ​sure​ ​they​ ​leave​ ​with​ ​a firm​ ​understanding​ ​on​ ​how​ ​to​ ​achieve​ ​relief.​ ​It's​ ​amazing​ ​how​ ​grateful​ ​these​ ​patients​ ​become once​ ​relief​ ​is​ ​achieved. What​ ​advice​ ​do​ ​you​ ​have​ ​for​ ​someone​ ​who​ ​is​ ​experiencing​ ​dry​ ​eye? So​ ​many​ ​patients​ ​think​ ​their​ ​eyes​ ​are​ ​normal​ ​and​ ​don't​ ​realize​ ​they​ ​are​ ​suffering​ ​from​ ​dry​ ​eye. It's​ ​not​ ​until​ ​a​ ​doctor​ ​asks​ ​the​ ​right​ ​questions​ ​or​ ​has​ ​the​ ​right​ ​clinical​ ​assessment​ ​for​ ​the diagnosis​ ​to​ ​be​ ​made.​ ​Find​ ​a​ ​practice​ ​that​ ​takes​ ​the​ ​time​ ​to​ ​sit​ ​down​ ​with​ ​the​ ​patient​ ​to​ ​get​ ​the right​ ​info.​ ​So​ ​often​ ​the​ ​exam​ ​is​ ​rushed,​ ​which​ ​doesn't​ ​allow​ ​time​ ​to​ ​assess​ ​the​ ​condition​ ​and adequately​ ​explain​ ​a​ ​treatment​ ​plan. Is​ ​there​ ​anything​ ​else​ ​you'd​ ​like​ ​to​ ​say​ ​about​ ​Envision​ ​Eyecare,​ ​this​ ​award,​ ​or​ ​dry​ ​eye​ ​and treatment? Dry​ ​eye​ ​treatment​ ​is​ ​a​ ​dynamic​ ​field​ ​and​ ​advances​ ​in​ ​treatment​ ​protocols​ ​are​ ​constantly​ ​being developed.​ ​It's​ ​easy​ ​for​ ​eye​ ​doctors​ ​to​ ​get​ ​in​ ​a​ ​place​ ​in​ ​their​ ​head​ ​where​ ​they​ ​think,​ ​'I​ ​am​ ​so​ ​tired of​ ​hearing​ ​about​ ​this. '​ ​​ ​Could​ ​I​ ​possibly​ ​sit​ ​through​ ​another​ ​dry​ ​eye​ ​lecture​ ​or​ ​article?​ ​It​ ​is important​ ​to​ ​look​ ​at​ ​dry​ ​eye​ ​treatment​ ​with​ ​a​ ​'beginner's​ ​mind. '​ ​Look​ ​at​ ​it​ ​as​ ​though​ ​it's something​ ​you've​ ​never​ ​seen​ ​before.​ ​Educate​ ​yourself​ ​on​ ​the​ ​new​ ​products​ ​and​ ​technologies.​ ​​ ​It is​ ​an​ ​opportunity​ ​to​ ​help​ ​a​ ​huge​ ​patient​ ​population​ ​and​ ​differentiate​ ​yourself​ ​from​ ​the competition. At​ ​Eye​ ​Eco,​ ​we​ ​are​ ​very​ ​fortunate​ ​to​ ​be​ ​able​ ​to​ ​work​ ​with​ ​some​ ​of​ ​these​ ​passionate​ ​helpful​ ​people​ ​who are​ ​improving​ ​the​ ​lives​ ​of​ ​others.​ ​We​ ​plan​ ​to​ ​highlight​ ​more​ ​of​ ​these​ ​practices​ ​that​ ​are​ ​dedicated​ ​to providing​ ​relief.​ ​If​ ​you​ ​have​ ​a​ ​recommendation​ ​for​ ​a​ ​recipient​ ​of​ ​the​ ​Outstanding​ ​Dry​ ​Eye​ ​Practice Award,​ ​please​ ​send​ ​us​ ​an​ ​email​ ​at​ I​​nfo@EyeEco.com​. At Eye Eco we are dedicated to finding solutions that provide relief from dry eyes, and we're not the only ones. Dry eyes affect more than 40 million Americans, but less than 5% of people have been properly diagnosed with Dry Eye Disease. Dry Eye Disorder can cause many health issues including obscured vision, dry skin, and even blindness. It can be caused by many things - including time looking at screens. For most of us that activity isn't going away anytime soon. At Eye Eco, we believe the best thing that can be done to keep eyes healthy and comfortable is regular visits to an eye care professional. Because dry eye can have several causes, figuring out the cause is an important step in finding the best treatment option. Optometrists and Ophthalmologists do incredible work to make sure we can clearly and comfortably see everything in our lives. We want to highlight some of the doctors who are as committed as we are to helping dry eye patients find relief. That is why we are starting a new campaign to acknowledge doctors by presenting them with Eye Eco's Outstanding Dry Eye Practice Award. Total ​Eye ​Care ​New ​Mexico ​is ​one ​of ​our ​first ​recipients ​of ​the ​award. ​Here's ​what ​the ​team, ​led ​by ​Dr. Daniel ​J. ​Dieterichs, ​had ​to ​say ​about ​receiving ​the ​award ​and ​about ​treating ​patients ​with ​dry ​eye. What​ ​were​ ​your​ ​thoughts​ ​when​ ​Total​ ​Eye​ ​Care​ ​New​ ​Mexico​ ​received​ ​the​ ​Eye​ ​Eco​ ​Outstanding Dry​ ​Eye​ ​Practice​ ​Award? It​ ​was​ ​an​ ​honor.​ ​​ ​We​ ​never​ ​get​ ​recognized​ ​for​ ​treating​ ​our​ ​patients. Total​ ​Eye​ ​Care​ ​is​ ​a​ ​small​ ​1-1/2​ ​OD​ ​practice​ ​in​ ​central​ ​New​ ​Mexico.​ ​​ ​We​ ​serve​ ​a​ ​wide​ ​range​ ​of patients​ ​from​ ​infants​ ​to​ ​the​ ​elderly.​ ​​ ​We​ ​have​ ​a​ ​rural​ ​practice​ ​so​ ​we​ ​are​ ​the​ ​only​ ​eye​ ​care​ ​for​ ​a 40​ ​mile​ ​radius.​ ​​ ​A​ ​few​ ​years​ ​ago​ ​we​ ​decided​ ​that​ ​dry​ ​eye​ ​should​ ​be​ ​treated​ ​and​ ​not​ ​ignored. This​ ​story​ ​is​ ​true​ ​in​ ​most​ ​offices...​ ​a​ ​lady​ ​shows​ ​up​ ​for​ ​her​ ​appointment​ ​and​ ​has​ ​a​ ​list​ ​of​ ​all​ ​the treatments​ ​that​ ​she​ ​has​ ​tried​ ​over​ ​the​ ​last​ ​few​ ​years.​ ​​ ​She​ ​has​ ​seen​ ​5​ ​other​ ​doctors​ ​and​ ​her friend​ ​said​ ​that​ ​we​ ​could​ ​help​ ​her.​ ​​ ​After​ ​examining​ ​her​ ​we​ ​diagnosed​ ​severe​ ​demodex blepharitis​ ​in​ ​all​ ​4​ ​lids.​ ​​ ​We​ ​scrubbed​ ​her​ ​twice​ ​with​ ​BlephEx​ ​and​ ​started​ ​her​ ​on​ ​EyeEco advanced​ ​lid​ ​scrubs.​ ​​ ​She​ ​complained​ ​that​ ​her​ ​eyes​ ​sting​ ​a​ ​little​ ​when​ ​she​ ​uses​ ​the​ ​scrub,​ ​but her​ ​lashes​ ​have​ ​been​ ​clear​ ​for​ ​three​ ​months​ ​and​ ​her​ ​eyes​ ​look​ ​normal​ ​again. Don’t​ ​just​ ​give​ ​out​ ​artificial​ ​tears​ ​and​ ​ask​ ​them​ ​to​ ​come​ ​back​ ​on​ ​their​ ​own.​ ​​ ​Start​ ​a​ ​therapy​ ​and then​ ​have​ ​them​ ​return​ ​in​ ​two​ ​weeks​ ​to​ ​see​ ​if​ ​it​ ​helped,​ ​then​ ​if​ ​needed​ ​change​ ​the​ ​treatment. Then​ ​reschedule​ ​for​ ​more​ ​follow​ ​up. See your optometrist to ensure that your eyelids are healthy first of all, then together we can work on producing healthy tears. Is​ ​there​ ​anything​ ​else​ ​you’d​ ​like​ ​to​ ​say​ ​about​ ​Total​ ​Eye​ ​Care,​ ​this​ ​award,​ ​or​ ​dry​ ​eye​ ​and treatment? We​ ​really​ ​could​ ​not​ ​have​ ​accomplished​ ​our​ ​goals​ ​without​ ​the​ ​help​ ​of​ ​Suzanne​ ​Paulson​ ​[from​ ​Eye Eco],​ ​she​ ​is​ ​a​ ​dynamo​ ​and​ ​is​ ​extremely​ ​supportive​ ​and​ ​truly​ ​cares​ ​that​ ​our​ ​patients​ ​achieve success. At Eye Eco, we are very fortunate to be able to work with some of these passionate helpful people who are improving the lives of others. We plan to highlight more of these practices that are dedicated to providing relief. If you have an recommendation for a recipient of the Outstanding Dry Eye Practice Award, please send us an email at Info@EyeEco.com. 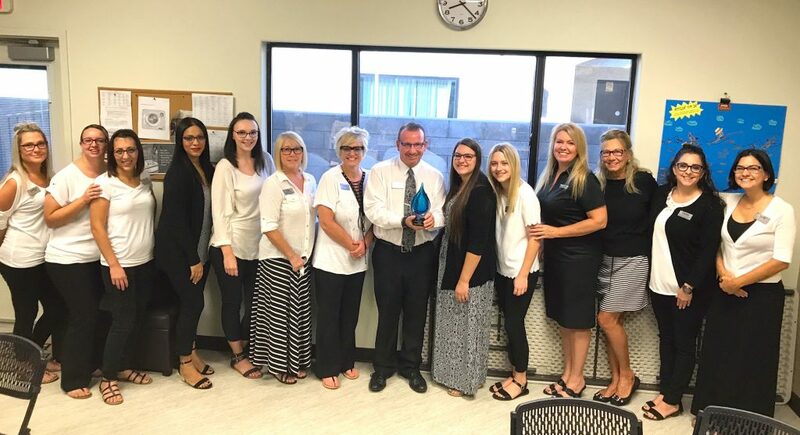 Lake Havasu Family Eyecare in Arizona is one of our first recipients of the award. Here's what Dr. Tania Sobchuk had to say about receiving the award and about treating patients with dry eye. 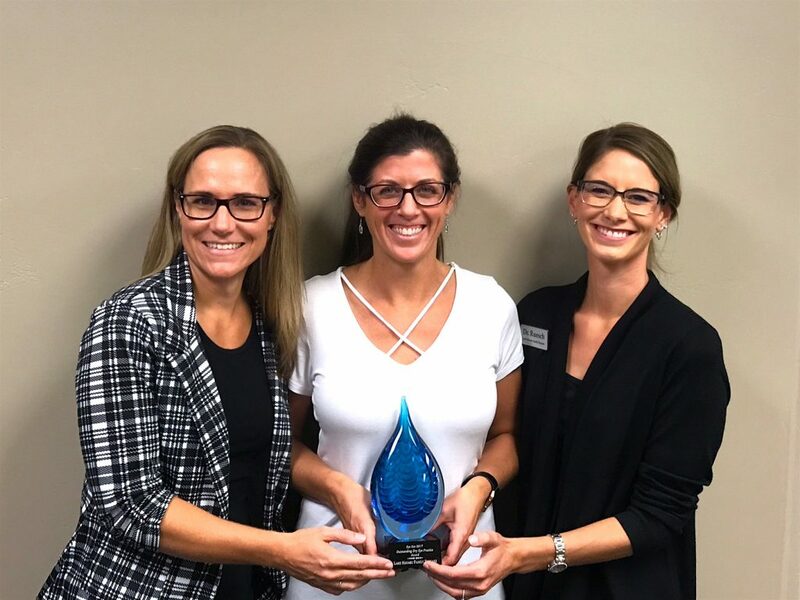 What were your thoughts when Lake Havasu Family Eyecare received the Eye Eco Outstanding Dry Eye Practice Award? We were so thrilled and very honored. We just started back in February getting really on board and aggressive with dry eye and it has just taken off! Patients are so thankful that we don't just glass over their problem and we actually do something about it. Working with Eye eco has really jump started our whole dry eye clinic. Do you have a story you can share about how your practice helped a patient(s) find relief from dry eyes? Please share. I had a new patient yesterday - 55yo female who first presented with scratchy red burning eyes, her eyelids were very red and irritated. She couldn't wear her contact lenses. We started her on the gentle tea tree Eyelid & Facial Cleanser (very sensitive eyes) and the DERM heat mask as well as artificial tears and also omega 3 supplements. After 3 weeks of treatment I saw her yesterday and was able to refract her, refit her with new daily MF contacts and her eyes felt so much better. They also looked better, not completely healed but SPK was less, and there was some expression out of her meibomian glands. She is a lot happier. We’ll continue all treatment and follow-up in 2-3 weeks. What advice or tip do you have about treating patients with dry eye? Be aggressive! Take the time to educate patients about the disease, share that artificial tears won't help, that they need to go to the cause (which is almost always MGD) and they need to be consistent and aggressive with treatment. One treatment isn't enough. A combination of heat, scrubs and internal therapy like omega 3 and water intake is needed. What advice do you have for someone who is experiencing dry eye? See an Optometrist who specializes in dry eye. Most ODs do not have the equipment, time or they lack intensive training and knowledge on the disease. Patients need to do research and ask questions, does the practice have equipment like blephex, lipiview, lipiflow - do they have a separate dry eye clinic when you come back for just treatment of the disease. 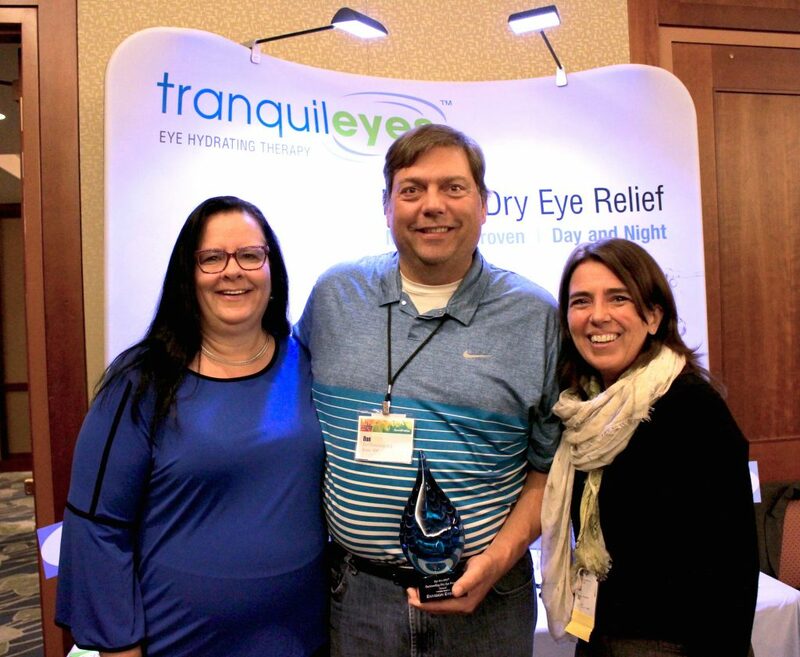 Is there anything else you'd like to say about Lake Havasu Family Eyecare, this award, or dry eye and treatment? We appreciate everything Eye Eco is doing in this field and encourage them to continue. We will be a loyal supporter of their products and cannot wait to launch our dry eye clinic and really treat these patients and make a difference in their quality of life. Eye Eco products change my patients lives. This video features Dr. Bruce Dornn, a leading Optometrist who specializes in managing symptoms related to Chronic Eye Conditions. Dr. Bruce Dornn strongly recommends our tranquileyes line of products. The patient response to this product has been very positive, with some patients claiming that the goggles have changed their lives, providing a much better quality of life. Tranquileyes with thermoeyes, while not a novel therapy, is a novel delivery system. For patients with just nocturnal lagophthalmos, the goggles are a good therapy; if we close the eye we are taking a big step in treating dry eye. However, for those with blepharitis or Meibomian gland dysfunction, tranquileyes with thermoeyes might prove to be fantastic. All of my patients experienced subjective benefits (i.e. extremely relaxing and comfortable to use) and 75% recognized measurable improvement in their dry eye condition within two weeks of using tranquileyes™ to enhance their existing treatment. One afternoon while perusing a magazine, I came upon an ad for a facial mask with a self-heating insert called thermoeyes. I was immediately intrigued. Tranquileyes masks are made from medical grade, flexible rubber material that is FDA approved. Tranquileyes and thermoeyes give my practice a very effective and more modern weapon for an age-old problem, Dry Eye Syndrome. This is the first product that has ever worked for me. I have tried every o.t.c. eyedrops and oils and prescription drops with no relief. This [Gentle Tea Tree Eyelid & Facial Cleanser] eyewash really helps with blepharitis flareups and is an great daily eyelid cleaner . I will be sure to tell my doctor about this. Yesterday's I went to my eye doctor. I have sleep apnea and Sjogren’s so my eyes are always very, very dry. Because of my condition, I’ve always had dry spots on my cornea. Yesterday, for the first time, my doctor found NO dry spots on my cornea! The only thing I changed was I had started sleeping in your mask. He said keep doing whatever it is that I’m doing because it is working! While I still have pain, your product has helped turn down the volume on the pain and make my eyes feel so much better. Thank you! I wanted to let you know that your eye mask is the best yet. Yesterday we installed new florescent lights in our office and were not able to get the solar/sun colored bulbs, our local hardware store ran out and we got about 6 blue ones instead. Within a few minutes my eyes really started to hurt, squinting and just felt really dried out while I was working on the computer (which is what I do all day). I thought of your eye mask which I had tried a few times in the last month. After having LASIK surgery, my eyes are very dry. My doctor suggested I try your product with my artificial tears. I was a bit skeptical at first however after the first couple of days using your product, my eyes started feeling better. I now wear my tranquileyes 30 minutes or so a day and not only do my eyes find a level of relief I can’t find using artificial tears alone, my entire body feels better – very relaxing. Thanks! You completely undersold your product. I purchased tranquileyes™ to relieve my dry eyes when I travel. Little did I know what a great product it is for getting a good night sleep! Last night I wore them to bed for the first time and to my amazement, had the best night sleep I have had in months! I can’t say enough good things about them. Thanks for the z’s! My mother has Sjogren’s and suffers from severe dry eyes. I read about your product and decided to buy one for my mother. She takes it with her everywhere! She absolutely loves it! As a matter of fact, whenever she receives a phone call, she now asks the caller to wait a minute, puts down the phone and slips her mask on. Her eyes feel so much better and they are extremely relaxing to wear. She is so excited about your product she bought one for her doctor, my sister and I. Thank you for making such a wonderful product! Hi, I have Sjogren's Syndrome and read about tranquileyes™ through the Sjogren's organization and decided to try them. Last night I wore my new tranquileyes™ for the first time. WOWOWOWOWOWOWOWOW!!!!!!!!!!!!!!!!!!!!!! Amazing! How wonderful it felt to wake up and NOT have my eyes dry and achy. Discovering Eye Eco literally gave me my life back! My tear production level was reduced by 80% when I was only 19! I lived in constant pain. My eyes were so dry that every time I blinked my eye lids would scratch my cornea since there was no tear fluid to protect my eyes. I had tried everything. Punctual occlusion, Moisture chamber glasses, putting in eye drops every 1/2 hour (that even had to be made up for me) and a trysorraphy (eye lids stitched 2/3 permanently shut). Nothing could stop the pain. Now more than 20 years later, and missing out on so many things in my life, due to the pain,(and I am not a wimp) I have had many other things in my life that caused pain, such as broken limbs, multiple surgeries, delivering my children, but nothing brought my life to a screeching halt as my eye pain. I have had to miss many things, or could not pay attention to the event, such as my children's activities, outings with my friends, social events with my husband (if I did try to go, because I really wanted to see my children in their different activities) I had so much pain that all ended up doing was trying to concentrate on not concentrating on the pain. Now, I use tranquileyes™ every time I sleep, including naps in the afternoon. If my eyes are bothering me more than average then I will put eye ointment in them and use the Thermo Pads. Thanks to these products, my eye pain has been reduced by about 85%, I can now enjoy outings with my friends, go out with my husband in the evening, and go to my children's events. I am so thankful that I found out about this great product!!!!!" I began to suffer with extremely dry eyes many years after reconstructive eyelid surgery, and another surgery would be necessary if an eye hydrating solution could not be found. I was fortunate to have found tranquileyes™ Deluxe Eye Hydrating Therapy. Now I have thoroughly hydrated eyes, no red spots, and I enjoy a deep full night of sleep while wearing the goggles as a night mask. Best of all, this thoughtfully designed product has saved me from additional surgery, and goes far beyond beautifying. I don't usually do this but your products have made a huge difference in my health and well being. I was diagnosed with Sjogren's Syndrome two years ago after my eyes had gotten so dry I could barely see out of my right eye. I ran across mention of your products on the Dry Eye Zone message board. I ordered the chronic dry eye kit and it's been a huge blessing. In addition to struggling with dry eyes, I work on a computer all day and my eyes get really strained. Tranquileyes™ have helped immensely with soothing the eye strain as well as hydrating my eyes. I ordered some of the Tini Bikinis and they are great for travel. I used one on an overnight international flight and they helped a lot - and they look super cute. I just wanted to take a minute to thank you for your products. They really do help and I appreciate the effort you put into developing them. I look forward to see what you have in store next! I am writing to praise your company for the invention and promotion of your Chronic Dry Eye Kit for Sjogren's syndrome patients. I purchased my first kit last year after reading about your product in the "Moisture Seekers" magazine. Immediate relief was my reward the first night using the eye mask. Later in the year I purchased a second kit, this one for travel, and then a third to give to my sister suffering from chronic dry eyes. We both are now proponents of your products. The story gets even better. This past Wednesday, I met with a Sjogren's research ophthalmologist at the National Institute for Health in Bethesda, MD as part of a study program I've been accepted into. With all the eye inflammations I've had over the years, due to Sjogren's syndrome, and the results of the testing done this past week it was expected that my cornea would be severely impacted. When all the tests were done and the final look at my eyes complete the doctor asked "what are you doing to care for your eyes? I can't get over how healthy your cornea is." I then went on to report my daily use of eye drops and the eye mask from your company to protect my eyes while sleeping. Hurray for the Chronic Dry Eye Kit. Using your product has helped protect my eyes from the normal progression of damage due to Sjogren's. You have a lifelong customer. Keep up the good work. Thank you for creating such a wonderful product. I first tried tranquileyes™ at a gift shop in the LAX airport. My eyes had been an irritated mess for days from an allergy and infection and I was panicking over what to do with my business meetings, knowing my eyes were not looking healthy and would be a distraction – sunglasses had been my only option. I tried tranquileyes™ on the flight and by the time I landed in New York my eyes not only felt better but surprisingly looked monumentally better. I am such an advocate of your product now. When admitted to the hospital for an emergency appendectomy a few months ago the one thing I repeatedly asked for from home was tranquileyes™, this being above my own pillow and toothbrush. Your product has provided me therapeutic relief when I needed it most. Tranquileyes™ has also eased my eyes from days out surfing in the salt water and sun, providing immediate relief for me to tackle the rest of my busy day. To Everyone at Eye Eco! For four years I have suffered from Recurrent Eye Erosions. They are painful and take days out of my busy life to recover from. Most of them were beginning in the early hours of the morning. I tried everything offered by my doctors. Then about a year and a half ago we moved to another state, necessitating a change of doctors. I'm thankful to God for this, as the local optometrist was doing internet research on my condition for a family here in our small community who suffered from a similar condition. One day, after a repeat visit to his office, he showed me your advertisement and suggested I try your goggles. That was in August. I have used them faithfully since and have not had an incident since then! That is a record for me, as I was in the doctor's office for management of this almost every month! I did find them a little awkward at first, and would wake to find them on top of my head or on the floor, but after a short adjustment period (two weeks) I find them completely comfortable. I no longer dread opening my eyes in the morning! I tell everyone I can about them. Thank you from the bottom of my heart! And thank you to Cloe for all the phone help! Thanks for your help this evening. I am looking forward to my new tranquileyes™. Tranquileyes™ proved to be central to my eyes healing and maintaining a healthy corneal surface after I suffered Recurrent Corneal Erosions (RCE's) for over seven months. In 2007, I experienced some irritation, occasional pain, tearing and redness in my eyes. At times, my vision was blurred. After going from doctor to doctor for about six weeks, I was finally referred to corneal specialist who diagnosed a corneal dystrophy, called epithelial basement membrane dystrophy (also known as anterior basement membrane dystrophy, map-dot-fingerprint dystrophy and Cogan's dystrophy). It causes the outermost layer of the cornea to stick to the eyelid, making it loosen and slough off with the above symptomatic results. I eventually found a corneal specialist who is an expert on diseases of the cornea and Dry Eye Syndrome (DES). He put me on a regimen of prescription eye drops, which helped at first, but I could not shake the symptoms. My eyes were so sensitive, that I was showering, dusting and gardening with uncomfortable swimming goggles, for fear of anything coming near my eyes. They were in frequent pain, due to the abrasion-like quality of RCE's. I had heard of tranquileyes™, but I was afraid to use them, because I did not want anything touching my corneas. However, at one point, the problem was so bad that I thought trying them could not hurt. After wearing them for one month, I had only one erosion, then I went for two and a half months without. Now, I can say that it has been ten and a half months without an episode, and I wear my tranquileyes™ every night. I must have lagophthalmos, the inability to close the eye fully, and tranquileyes™ do two things for me. 1) They ensure that my eyes are full closed during sleep and 2) They buy me valuable time in the morning to open my eyes slowly, adding eyedrops, if necessary, so that the cornea does not rend. Although mine is a sever case, I suffered for years with dry eyes and received only bland eye drops from my eye doctors. If I had known about tranquileyes™ sooner, I would have avoided a lot of pain, suffering and missed work. Tranquileyes™ is central for managing my DES and RCE's. Though I tried sleep masks of a couple of different varieties, the y do not hold my eyes closed, like tranquileyes™ do, and they do not create the optimal moisture environment that I have found using tranquileyes™ dry. They do so much to prolong my ability to do all of the reading and writing in print and online that I do for work that I am buying a second pair, so that I can treat my eyes with a cool compress in the evenings and still have my dry pair to wear all night. Tranquileyes™ are the reason that I turned the corner toward real healing after a series of injuries to my cornea. Thanks, Eye Eco! You returned to me my normal life.